Home » Field Test » *NEW* Maven RS.1 Rifle Scope (2.5-15X44) Field Test & Review – How Does it Perform? "If there's a scope that's worth more than it costs, that can improve accuracy in the field, and can make you look good while doing it, it's the Maven RS.1. I'll even go so far as to say that Maven just might be my new favorite brand." Following the debut of Maven’s successful B1 binoculars in 2014, there were high hopes for when they would eventually release a rifle scope. That year has come and the RS.1 scope far from disappoints. From first look, the scope seems awfully expensive for those who dabble in the few hundred-dollar range. It’s also the brand’s first rifle scope, so did they nail it, or are there tweaks that need to be made? It also begs the question, “What makes the RS.1 worth its price tag?” This is the angle I wanted to explore in the field test. It’s one thing to see awesome specs online, but it’s another to get said results in the field. Let’s put Maven’s reputation on the line as we scrutinize the RS.1 rifle scope for performance and value, and if their scope makes it in a cutthroat business amongst other high-end giants! The scope came very well packaged. It had plastic wrapping and balloon bags to keep the scope tight and secure during shipping. Even upon box opening, the scope was well wedged between a foam insert that held it in place. For a scope of this quality and price, I’d say it was well protected and secure. I admire the simple, yet striking box design of Maven’s product colors: black and orange. It’s classy and the lack of crammed décor adds to its premium look. The black box is a sleeve that houses a white and orange box that holds the scope. Underneath the scope is another hidden compartment that holds the instructional pamphlet and a neoprene cover. The cover is surprisingly high quality for an included accessory, and it feels extremely durable. I fit the scope in and the cover stretches to house it from the eyepiece to objective bell. It sits in there nice and snug and there’s no zipper because it’s meant to be placed on the scope when it’s mounted to the rifle. It keeps it protected when not in use as well as from stray twigs, falls, and bumps when trudging to and fro in the wilderness. The cover negates the need for lens caps, but we still don’t deny the convenience of quickly popping on caps while in the hunt. You’ll have to purchase caps separately. You won’t get one of these as a freebie, but Maven sent me a themed buff with the scope. It has both Coolmax Pro and Polygiene odor control technology to keep you cool and fresh. How do you wear it? It’s up to you to get creative. I tried it as a neckchief, hairband, headband, and wristband, but it can be worn multiple ways. If it had been sunny out, I probably would’ve worn it as a neck scarf to keep my neck from getting sunburned. Inspecting and holding the scope invokes feelings of pride. It’s a high-quality scope that I was proud to be seen out and about with. Its robust and sleek build caught the attention of others as I swaggered my way through the store looking for rings to mount it to my rifle. But, apart from my vain streak and how badass I felt it made me look, there’s more to it than just its aesthetic appeal. The magnification range of 2.5-15x is an excellent power range for a hunter. It pairs perfectly with its SHR (Simplified Holdover Reticle) reticle for quick close shots and holding over for extreme long shots well beyond 600 yards. I was pleased with the wide power ring and its texture. The raised indicator lever makes it easy to know where you’re at in the power range, and it makes for quick and easy changes. To take those long shots with a power range up to 15x, it has a side focus allowing focus and parallax correction from 10 yards to infinity. It has clear markings for 10, 15, 20, 30, 50, 75, 100, 150, 200, 300, 500, and infinity. The side focus moves with fluid action with sufficient resistance to prevent moving it accidentally. Although the side focus is very convenient, I found that I either didn’t need to fiddle with it, or I kept forgetting. In fact, as a side note, many misplaced or missed shots aren’t necessarily due to forgetting to correctly adjust your side focus, it’s usually due to being in the wrong magnification range. With that being said, I’m proud to report that clarity, focus, and sharpness was on-point throughout the entire field test. The scope has a clean, anodized finish. Logos and markings are evident from the eyepiece to the objective bell in a way that’s not overwhelming. The objective lens is recessed into the bell to allow for threading additional accessories if you have the need. The turret caps are heavily knurled, so much so that my smooth-as-a-baby’s-bottom fingertips felt a little pinched when removing them. With gloves on, caps can be put on and taken off easily. 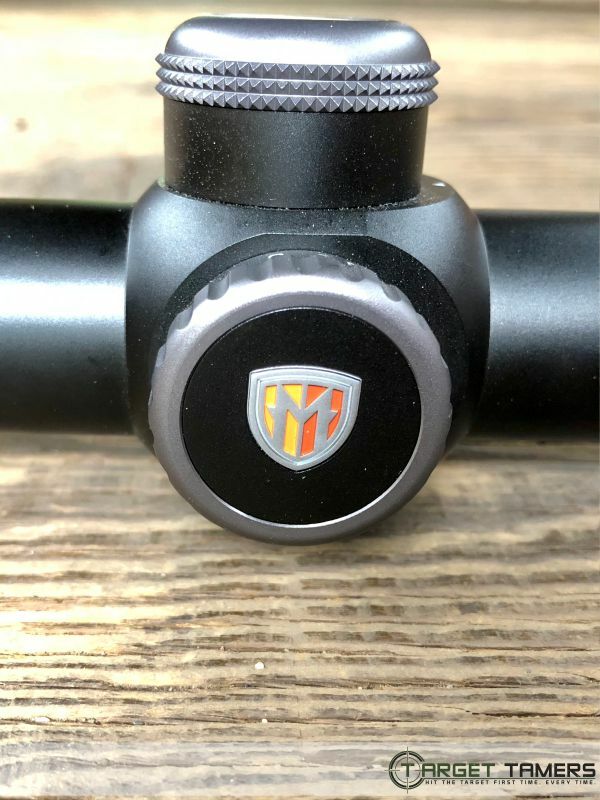 The Maven scope offers an extensive 70 MOA in windage and 100 MOA in elevation adjustments thanks to its robust 30 mm tube. 1/4 minute clicks are tactile and audible, and I found they moved with ease and precision. While I’ve heard about others finding the clicks to be too fluid, accidentally moving through 2-3 clicks at a time, I didn’t find that to be an issue for me. Being deliberate when counting adjustments was easily done, and I found that there was enough tension to avoid over adjusting. I’d say it’s right on target with quality comparing to other high-end brands. This scope comes with either the SHR or MOA reticle. The former is the one I chose for this field test, and it’s absolutely appropriate for hunters and ranges above 600 yards while making adjustments. It’s a duplex reticle with basic windage markings and three additional distance yardages for holdovers. The Japanese glass has an etched reticle that’s first-rate in the scope field. Glass-etched reticles are an indication of high-end quality – it’s practically indestructible. The reticle is also in the first focal plane (FFP) meaning holdovers are accurate no matter what power range you’re in. This allows for utmost accuracy for all shots, and not just at max power. 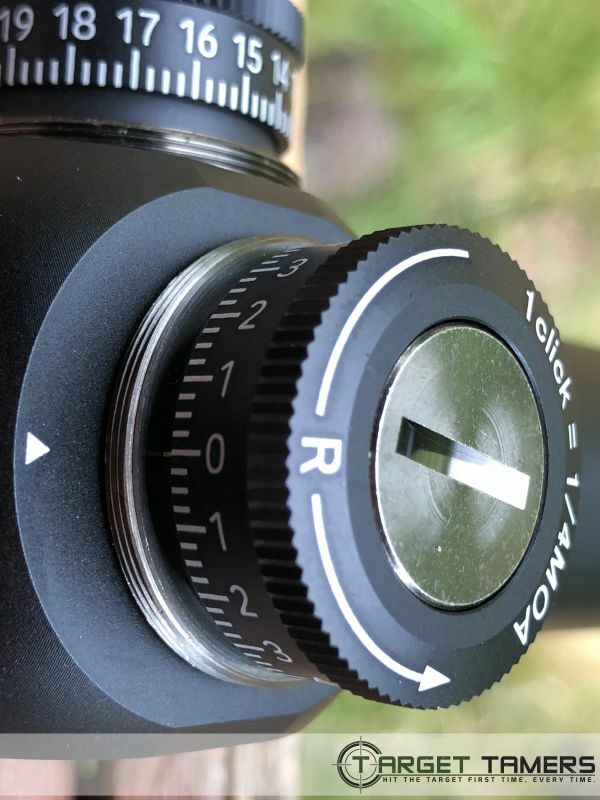 The MOA reticle is quite complex; however, it’s not overwhelming as some tactical reticles can get. It has a German-style crosshair with stadia lines to account for windage adjustments and hashmarks for precision long-range holdovers. The RS.1 rifle scope has an IPX7 rating for waterproofness up to 3 meters. It’s also nitrogen-purged for fog-proof and airtight benefits. Monsoon season has just started so it was no surprise that the heavens were pouring down the day I headed out for some pics. It wasn’t just sprinkling, it was a full-on downpour. I let the scope get drenched, gave the lenses more than a few wipes, and let it airdry in my truck. Checking on it a few days later in humid weather and there’s no internal fogging or signs of leakage anywhere just as I expected. Focusing the RS.1 scope was easy. I picked a blank wall in my house and rotated the eyepiece while looking away intermittently. This is to prevent my eyes from auto-focusing the reticle. While there is no locking mechanism, I’ve experienced no encounters of it moving out of place. Here you can see this correctly focused reticle and unfocused, fuzzy reticle. I played around with the side focus and targets at various distances to ensure clarity was optimal. I spotted some antelope just beyond my drive way, but I couldn’t get the scope steady enough to take free-hand photos on an optic with such long eye relief (3.4-3.9 inches). I took photos ranging from low power of 2.5x through to max power of 15x with no additional magnification from my camera phone. Let me just say that my pictures don’t do the scope justice. It was raining hard, I had droplets on the lenses of the scope and camera, and I often forgot to fiddle with the side focus to achieve maximum focus for photos – I’m not a professional photographer, I’m an outdoorsman! Any apparent image softening, CA, and graininess is due to the camera trying to auto-focus while I found the eye-box. Despite that, what I could see with my own eyes was true-to-form color rendition, zero chromatic aberration (CA), and excellent edge-to-edge flatness without softening. I have to say, Japanese glass sure is something else altogether, and it will give German glass a run for its money. Glass, image, and resolution quality through the Maven rifle scope was a heck of a lot better than what I was expecting. What was I expecting? Better than average, but nothing outstanding, and fortunately, I was proved wrong. Having peered through the C1 binoculars which is amazing, it wasn’t the same as looking through the riflescope which was breathtaking. Brightness, color fidelity, and sharpness were way above par for my expectations. ED (extra-low dispersion) glass always makes a difference in the field, but it really makes a difference when weather conditions aren’t on your side. I was glad for the rainy day because then I could see what this scope was really made of. While Maven doesn’t tout the normal marketing flair of fancy and made-up coating terminology, this scope does have fully multi-coated optics that obviously adds to its greater than 89% light transmission rate. I had the RS.1 scope mounted on a Smith&Wesson 270 with Warne Maxima 30 mm medium height steel rings. The ring screws are dressed in a little Loctite, and finally, the scope is bore sighted. I head out to the range and get my gear set up. I’m using a bench with sand bags, and Federal Ammunition 270 Win. 150 grain soft point RN ammo. I start off at 25 yards to get on paper – fun and done. It starts sprinkling on and off and winds speeds are 19 mph left to right. For Summer weather up here, at least the day is cool. I start fresh with a new target and move to 100 yards to zero the scope. I have it on max power and a spotting scope set up on the table to confirm shot placements, so I’m all good to go. My first round of shots are just to get on paper and have fun at that distance. After some mucking around, I change out the target and get down to business. My first was a flyer 1.5” high and a little over 1” to the right. I make some conservative adjustments and let another one fly, and I hit the 10-ring. I make even tighter adjustments and let two go and I’ve got bull’s-eye. Turrets were tight and purposeful, and the scope was exceptionally responsive. By this time, my shoulder is hurting even though I took breaks during cease fire periods, but it’s already been well over an hour. 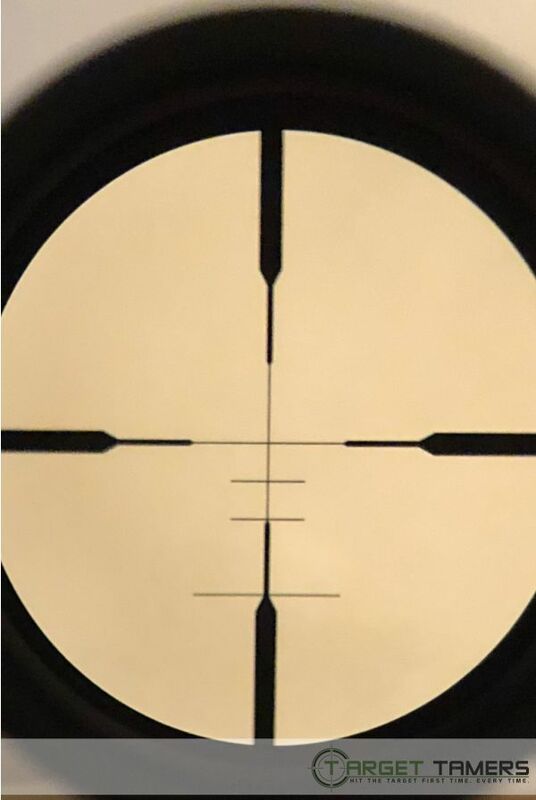 Although I learned that this scope has a ton of potential, I’ve got a lot more shooting to do with it to really see it shine, and next time I’m going to try Remington 270 Win. 150 grain Core-Lokt SP rounds. My shooting skills have yet to come up to par with my knowledge of optics, and the Maven RS1 scope makes it easy to find the time to make an excuse to head to the range. Nearly everyone is a better shot than me, so getting on target with the RS.1 will be a breeze for you! Since the scope doesn’t have a zero stop, I had to manually unscrew the turrets. I used a nickel to completely loosen the turret taking the screw out. I put the turret back on with the 0 back at the indicator mark and then tightened the screw back into the turret. This well-oiled machine can easily withstand high recoil from much larger caliber rifles. I think it just might be able to withstand all abuse save for being run over by a truck – who knows, maybe even then too, I didn’t want to try it. Rain didn’t hinder its ability to focus and get on target. Zeroing the scope was just as expected – instant and accurate. It tracked perfectly with adjustments and that’s all thanks to its tight internal erector system. So, what makes this scope worth its price tag? Japanese glass with ED elements for maximum clarity, sharpness and brightness. Color fidelity is neutral allowing for true rendition to spot game in the field. Its 30 mm tube allows for extended adjustment ranges, and the glass-etched FFP reticle is high-class and sharp. It’s recoil-proof, extremely durable, and weatherproof to endure the harshest weather you dare to trudge in. The versatile power range of 2.5-15x provides excellent image quality throughout the entire variable range. Why should you lose clarity at max power? Only cheaper scopes do that, but the RS.1 ain’t no bottom-barrel scope now, is it? This is a scope that’s right on par with its competitors like Swarovski and Meopta. It’s been outfitted with the best-of-the-best features that qualifies it as a high-end and premium scope. The best part is, you don’t have to pay what you would consider “normal prices” for it. Without middle-man retail interference, you’re getting the best materials and quality at the lowest prices possible. 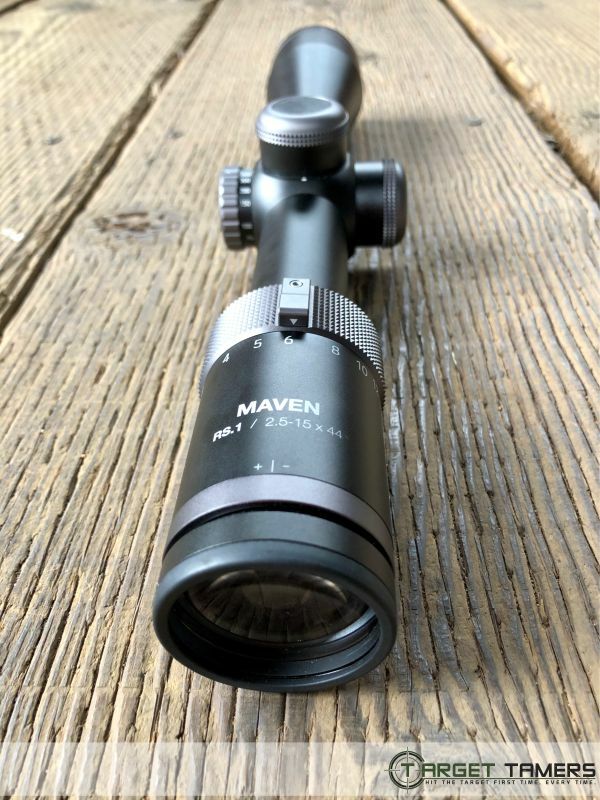 If there’s a scope that’s worth more than it costs, that can improve accuracy in the field, and can make you look good while doing it, it’s the Maven RS.1. I’ll even go so far as to say that Maven just might be my new favorite brand. Quit paying for over-priced quality when you can get more for less! Many thanks to Maven for sending us this rifle scope to field test & review. Please note, even though this product was provided by the manufacturer all of the opinions expressed here are our own and are not in any way influenced by any manufacturers.